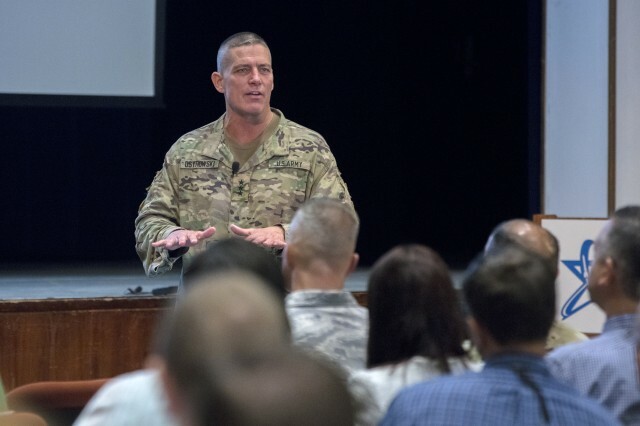 The future of acquisition will be faster and more efficient, according to the top military officer for the Assistant Secretary of the Army for Acquisition, Logistics and Technology, or ASA (ALT). 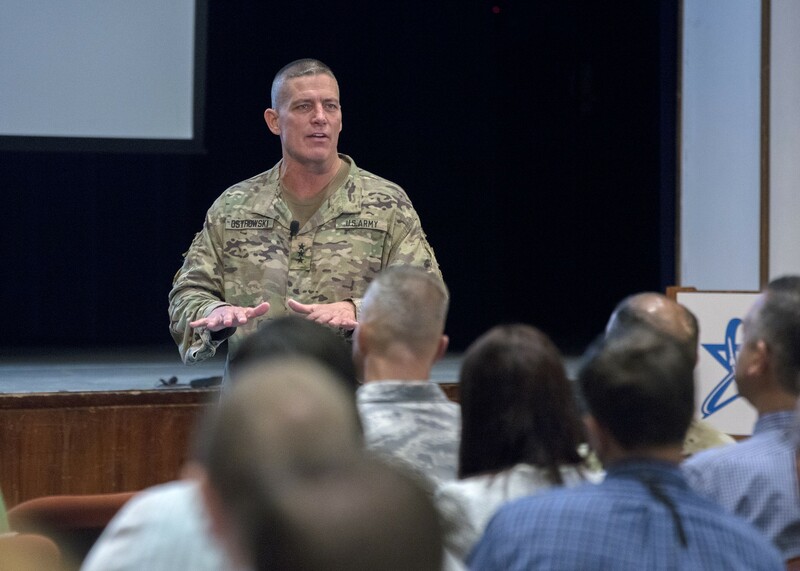 Lt. Gen. Paul Ostrowski, the principal military deputy to the ASA (ALT), briefed the Program Executive Office Ammunition workforce at Picatinny Arsenal on the future direction of Army acquisition in light of the recent activation of the Army Futures Command. The recent town hall was Ostrowski's fourth on this subject. He is traveling to the various Program Executive Offices, or PEOs, to explain how the Army Futures Command will affect their mission. "Frankly, it is an exciting time," Ostrowski said. "And I wanted to get out and have an opportunity to engage with you, and have you engage with me, and answer your questions because it's that important with respect to what is going on in terms of modernization." Ostrowski explained that former Cold-War era style acquisition processes for developing and fielding materiel are changing to allow the military to keep pace with ever-evolving threats and technology. Congress is providing flexibility by changing some laws. One change gives the Army Other Transaction Authorities, or OTA, which allow the PEOs to enter into Full Rate Production quicker by permitting the services to control their own program of records instead of the Office of the Secretary of Defense. The Army has over 800 programs of record. "That's one layer of bureaucracy that the PEOs had to go to that's been eliminated," Ostrowski said. To modernize acquisition for greater efficiency, the Army assembled a team to review the entire acquisition process, which issued several directives to streamline processes. Also, the team created eight Cross Functional Teams, which will be part of the new Army Futures Command. The CFTs are intended to reduce the requirements process by increasing collaboration between various members of the acquisition process -- the project manager, testing community, logisticians, industry, science and technology community, and more -- and get them on the same page. "Bring them all together in one group and develop our requirements. What will we get out of that? First of all we'll get speed," he said. In the past, it could take a program 10 to 15 years from the time a capability gap was identified in the field and the time that a solution was available. "Everyone understands how that is not sustainable," Ostrowski said. In addition to making the requirements development process quicker, Ostrowski said that with early involvement by all the stakeholders, the CFTs will ensure that the requirements handed to the project managers are realistic and stable. "These CFTs that are going to work with us through the acquisition process," he said. "They are going to shepherd this thing and they're going to be the ones we go back to and say, we need to get a little bit of relief on this, this and this. They will be involved all the way through. "The whole concept of CFTs must perpetuate through the rest of the Army," he added. "That's up to us to execute. So if you're a PM, you better start forming your own CFT. It doesn't have to be formal. But get with your user, get with your entire community and say let's do this together. Because this is a new culture change and we need to make sure it happens."